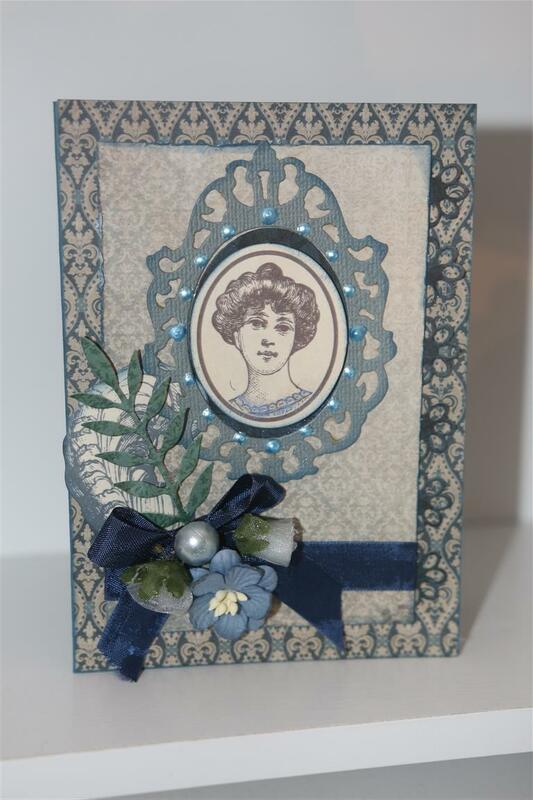 Here are the last two cards I made with kaisercraft betsy’s couture. I hope you have enjoyed seeing them as much as I enjoyed making them! The top card follows the same sketch as previous cards, but with the bottom card I wanted to try a little experiment using texture paste – I wanted to see if it made the card too heavy. 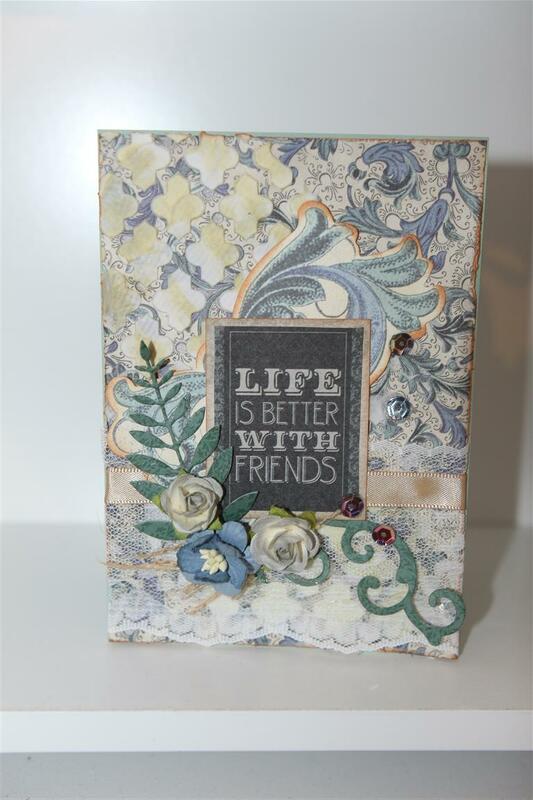 I used a light texture paste, and I had no problems with the card standing so will be using this technique more often !After applying the paste through a stencil and letting it dry i wiped over the paste with Antique linen distress ink pad, added some die cuts, ribbon , lace, and flowers.for now its off to work i go, til tomorrow…. 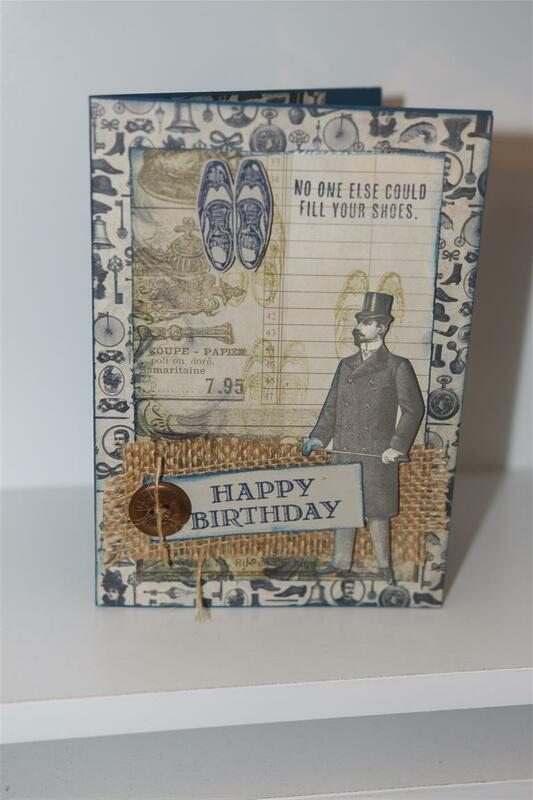 Kaisercraft Bestys couture 7 and 8 mens cards…. 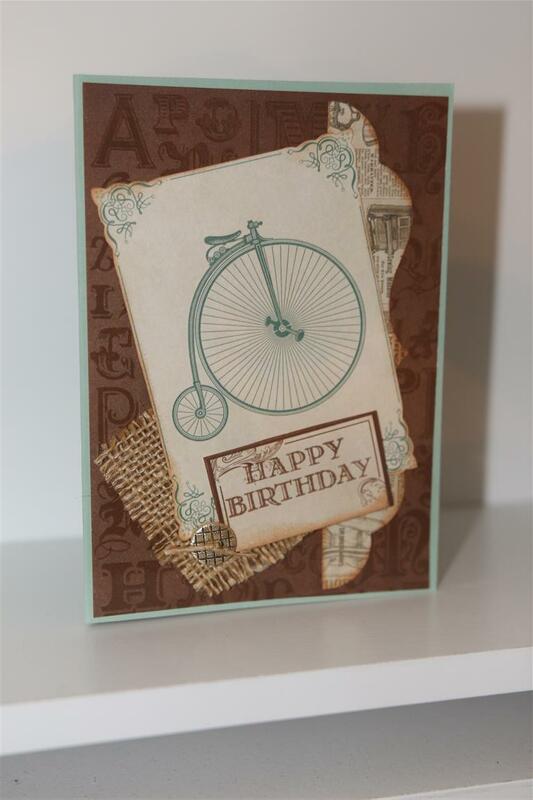 Today I have managed to pull myself away from the craft room, where I have been on a creative roll, to post these two mens card ideas using Kaisercraft betsys couture papers, and a stampin up stamp set – guy greetings. I added some hessian and a button for some texture. Always like it when I can make a mens card out of a predominately feminine paper collection!For now it’s back to the craft room! til tomorrow….. 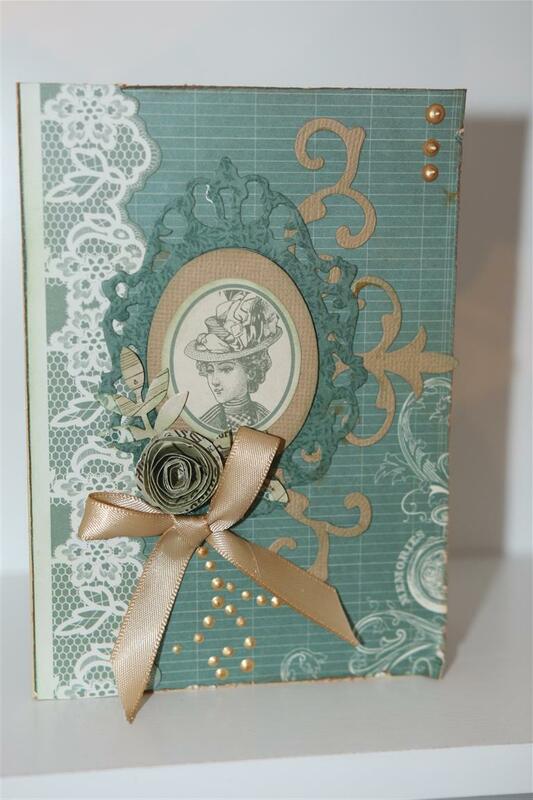 The top card uses Kaisercraft betsys couture 12 x 12 papers, and the bottom card uses papers from the 6 inch pad. 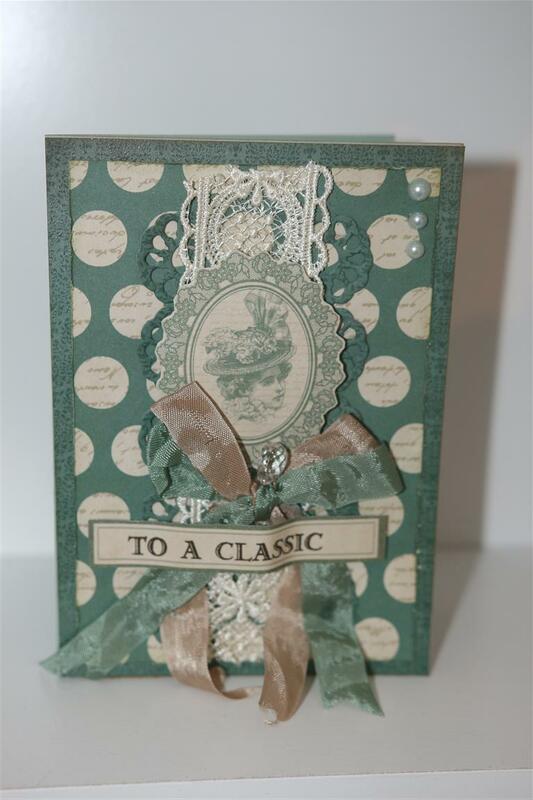 Both cards have an assortment of matching collectables, lace, ribbon, prima flowers, hand rolled flowers, liquid pearls, kaisercraft assorted dies, leaf punch, seam binding and lace.I picked my husband up from hospital this morning, and while on nursing duties I sat down to organise a class for May using some new simple stories paper. Eight or so cards later I have realised I have exceeded the three we usually do in a class, so I am thinking I will take them all along and let the ladies choose which ones they want to do. This paper ( collection is called I am) is terrific ..the ideas keep coming so glad I bought some for myself – I can’t wait to get back to it! 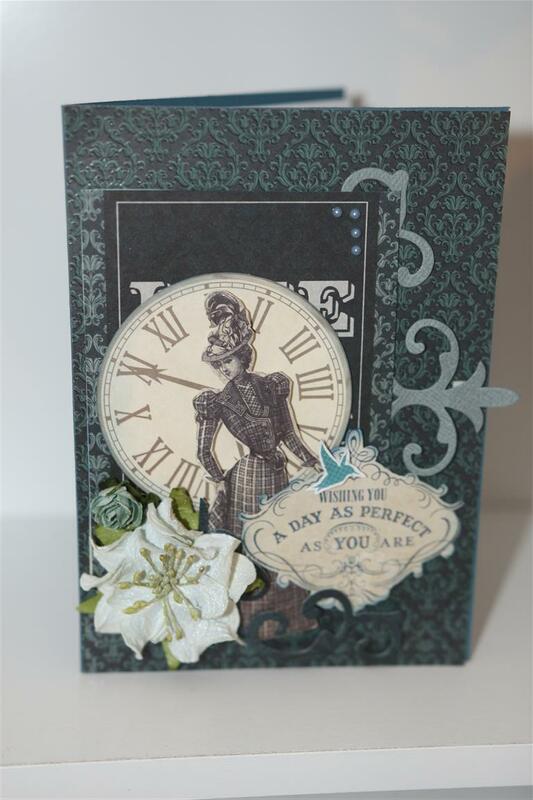 Til tomorrow…..
For this card made with kaisercraft betsys Couture collection i used the 6″pad, and the sticker sheet. other kaisercraft products were the Ornate frame die, and the flourish die.I made a rolled flower,punched a couple of leaves and added liquid pearls and a ribbon bow. Quick post this afternoon as I am off to take my husband to the hospital where he will have his operation on both knees… I think he will try anything to get out of the kitchen renovations that are happening here at the moment! til tomorrow…. 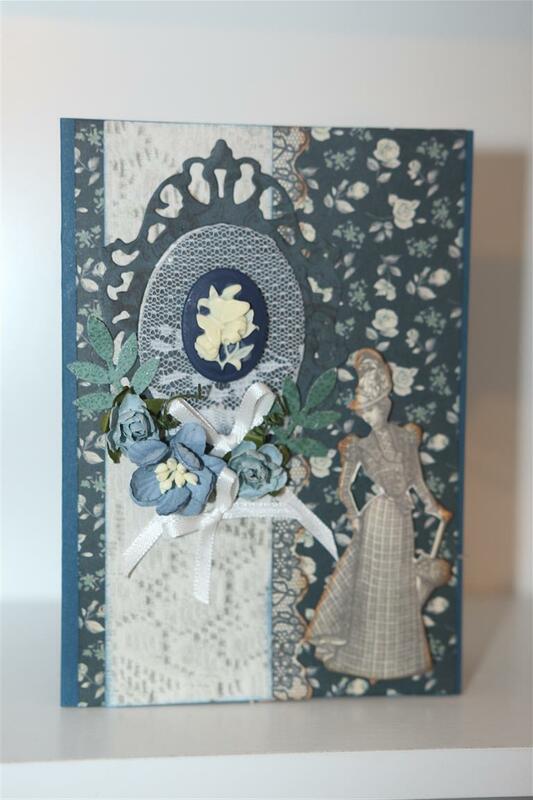 Two more vintage cards today, using the Kaisercraft betsys couture paper collection.Top card…12 x 12 papers,collectables,kaisercraft flourish die, flowers and lace. 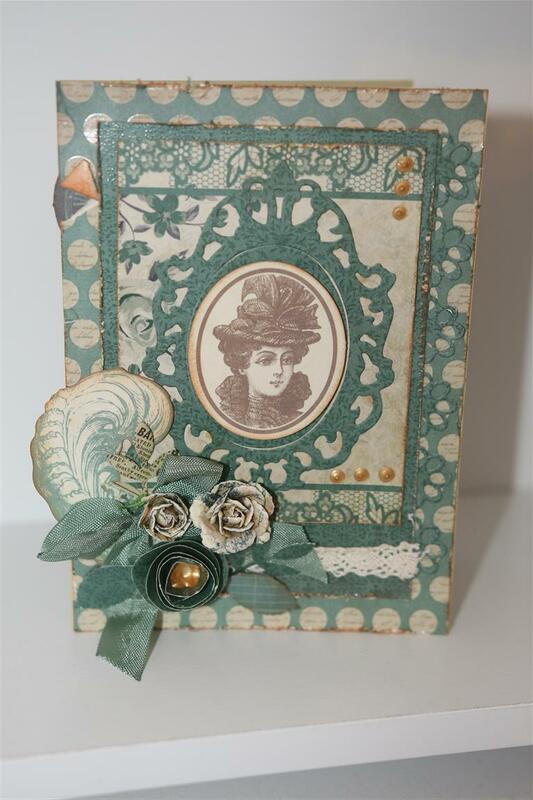 Bottom card….a mix of 6″pad and 123 x 12 papers,(the cameo was fussy cut from a full sheet of cameo images)Kaisercraft border die, lace, seam binding and a pearl topped hat pin. My back is much better today, thank you for all your healing wishes, til tomorrow….. 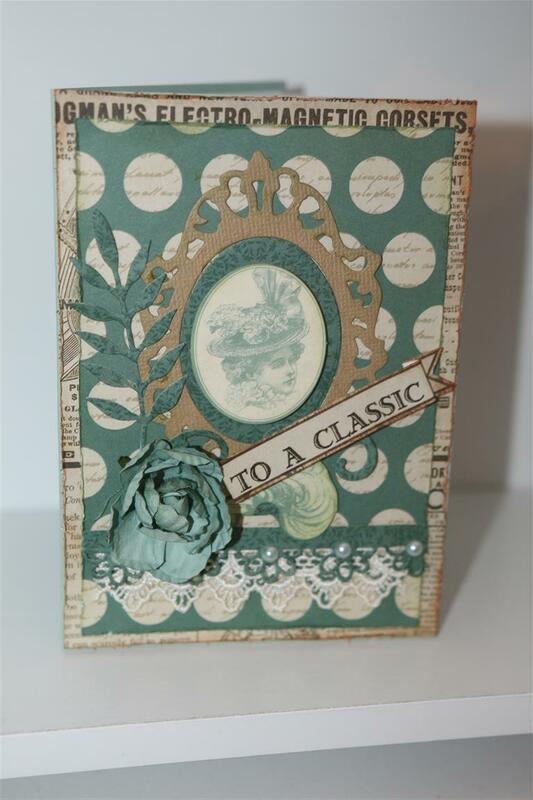 Recently I bought some of kaisercraft’s recent release – Betsys Couture. I knew once I started with this paper it would be hard to stop, so we have quite a few here in the queue! Before I started I die cut a few Ornate frames ( Kaisercraft die) so that I wouldn’t have to interrupt the creative process by bobbing up and down to the big shot.I used one on this card, wrapped the inner oval with lace and stuck on a websters pages cameo – I have a little box on my table full of these little odds and ends from other projects, and often use bits from it on projects.The papers were from the 6″ pad,as was the lady who I fussy cut out of the paper. sponged around all the edges with tea dye ink, flowers, punched leaves and ribbon to finish.My back is almost better today, and I am sure it will be perfect for work tomorrow! At lats i am able to sit, although not for to long, but long enough for me to relax in the craft room for a little while this afternoon. Til tomorrow…..